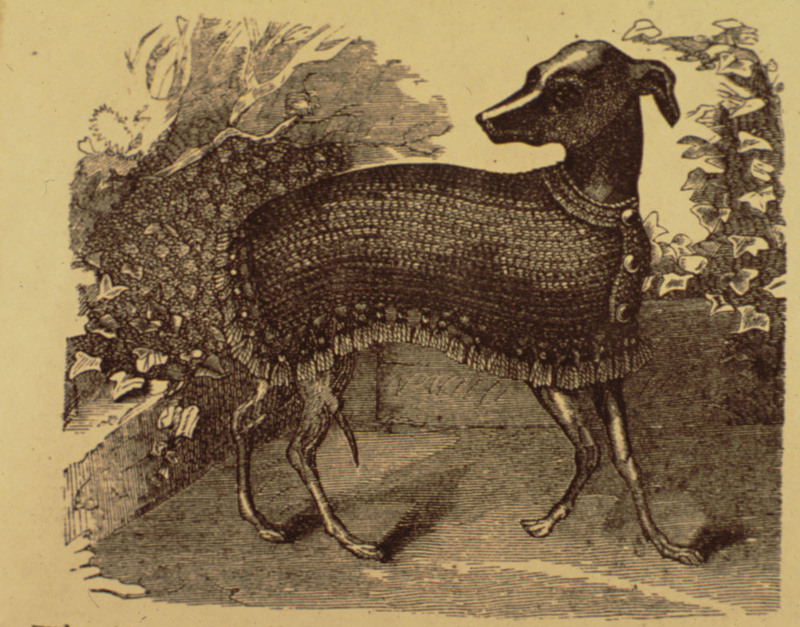 In May 1873, Godey’s Lady’s Book, the most famous women’s magazine in nineteenth century America, published instructions on how to make this crocheted coat for a small dog. The fashion victim illustrated in the wood engraving of the result of this home craft project is an Italian greyhound, who would certainly have needed a coat like this in an unevenly heated American house. As I recall, the pattern calls for red and blue wool yarn. The coat also had small bells for buttons, so the dog would jingle as he trotted along. Collars for small house dogs often had bells, too. But back to our Italian greyhound with his elaborate coat. While having a jingling animal may not appeal to modern pet owners, I think that Victorian dog lovers would have found this a cheerful sound. Remember that the world was a lot quieter than it is today! Kind of like having wind chimes inside your home! Kind of like having wind chimes in the house!